ยอดผู้ติดตามและผู้เข้าชม ณ วันที่ 10 เมษายน พ.ศ. 2562. ↑ Wadeson, Danny (6 September 2013). "Gamertube: PewDiePie and the YouTube Commentary Revolution". Polygon. Archived from the original on 27 June 2015. สืบค้นเมื่อ 22 June 2015. ↑ Wai Yee, Yip (27 May 2013). "Stars get social on the red carpet". The Straits Times. Archived from the original on 18 July 2013. สืบค้นเมื่อ 29 May 2013. ↑ 3.0 3.1 PewDiePie (24 November 2016). I WAITED 4 YEARS FOR THIS!!!!. PewDiePie. YouTube. Archived from the original on 25 November 2016. สืบค้นเมื่อ 26 November 2016. ↑ PewDiePie (11 June 2016). THE DIAMOND PLAYBUTTON (Part 3). PewDiePie. YouTube. Archived from the original on 12 June 2016. สืบค้นเมื่อ 11 June 2016. ↑ PewDiePie (18 December 2016). THE RUBY PLAYBUTTON / YouTube 50 Mil Sub Reward Unbox. PewDiePie. YouTube. Archived from the original on 15 June 2017. สืบค้นเมื่อ 18 December 2016. ↑ Sydell, Laura (30 December 2013). "Hot on YouTube: Videos About Video Games, And Science, Too". NPR. Archived from the original on 31 December 2013. สืบค้นเมื่อ 30 December 2013. ↑ "Kjellberg pronunciation". Forvo. Archived from the original on 27 November 2016. สืบค้นเมื่อ 23 November 2013. ↑ 9.0 9.1 "PewDiePie about". YouTube. สืบค้นเมื่อ 19 April 2014. ↑ "Top 100 YouTubers by Most Viewed". Socialblade. 2 January 2014. สืบค้นเมื่อ 7 January 2017. ↑ Parker, Trey (21 April 2016). "The World's 100 Most Influential People: Felix Kjellberg (a.k.a. PewDiePie)". Time. สืบค้นเมื่อ 8 May 2016. ↑ TV Interview With PewDiePie - May 5, 2012. YouTube. 5 May 2012. สืบค้นเมื่อ 27 September 2015. ↑ PewDiePie on SVT. YouTube. 16 April 2012. สืบค้นเมื่อ 27 September 2015. ↑ Gutelle, Sam (23 April 2013). "'Epic Rap Battles of History' Posts Russian Showdown To End Season 2". Tubefilter. Archived from the original on 27 December 2014. สืบค้นเมื่อ 11 February 2015. ↑ Internet Icon S2 Ep8 – The Trailer Challenge (Part 2 of 2) Feat SMOSH, Jenna Marbles, and PewDiePie. The YOMYOMF Network. YouTube. 11 July 2013. Archived from the original on 23 May 2015. สืบค้นเมื่อ 11 February 2015. ↑ PewDiePie (English Interview) "I sold hot dogs". Skavlan. YouTube. 28 November 2014. สืบค้นเมื่อ 27 September 2015. ↑ Spangler, Todd (2 December 2014). 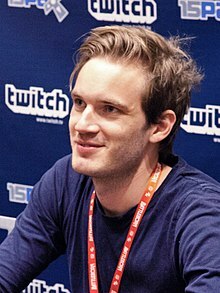 "South Park' to Feature Cameo by YouTube Star PewDiePie". Variety. Archived from the original on 24 December 2014. สืบค้นเมื่อ 1 January 2015. ↑ Jarvey, Natalie (21 July 2015). "Patrick Stewart, PewDiePie to Voice Characters in 'Oscar's Hotel' on Vimeo". The Hollywood Reporter. Archived from the original on 27 July 2015. สืบค้นเมื่อ 23 July 2015. ↑ Crecente, Brian (2 October 2015). "The Internet's Pewdiepie meets TV's Stephen Colbert and Swedish swearing happens". Polygon. Archived from the original on 3 October 2015. สืบค้นเมื่อ 4 October 2015. ↑ Rody-Mantha, Bree (28 October 2015). "New series Pugatory features the voice talent of PewDiePie". StreamDaily. สืบค้นเมื่อ 11 April 2016. ↑ Kleckner, Stephen (21 October 2015). "'Scare PewDiePie' is YouTube Red's exclusive reality show". VentureBeat. สืบค้นเมื่อ 19 November 2015. ↑ Makuch, Eddie (9 February 2016). "Watch PewDiePie Talk With Conan O'Brien About His "Very Specific Audience"". GameSpot. สืบค้นเมื่อ 12 April 2016. ↑ AFP Relax (21 May 2013). "Social media aggregator to host inaugural awards". Yahoo! News. Archived from the original on 31 October 2013. สืบค้นเมื่อ 29 May 2013. ↑ Jones, Steve (23 May 2013). "Social Star Awards recognise Bieber, One Direction". USA Today. Archived from the original on 24 May 2013. สืบค้นเมื่อ 23 May 2013. ↑ Lee, Jan (25 May 2013). "Aaron Aziz more popular in social media than Fann Wong and Jeanette Aw". Asia One. Archived from the original on 21 June 2013. สืบค้นเมื่อ 27 May 2013. ↑ Ngak, Chenda (9 April 2013). "Shorty Awards 2013 honors Michelle Obama, Jimmy Kimmel". CBS News. สืบค้นเมื่อ 15 April 2013. ↑ Vulpo, Mike (10 August 2014). "2014 Teen Choice Awards: The Fault in Our Stars Win Big, Maid in Manhattan Reunion & More Highlights". E! Online. สืบค้นเมื่อ 11 August 2014. ↑ "4th Annual Streamy Awards Nominees". Streamys. สืบค้นเมื่อ 20 September 2014. ↑ Steiner, Amanda Michelle (16 August 2015). "Teen Choice Awards 2015: See the full list of winners". Entertainment Weekly. สืบค้นเมื่อ 17 August 2015. ↑ 30.0 30.1 "5th Annual Nominees". Streamys. สืบค้นเมื่อ 17 August 2015. หน้านี้แก้ไขล่าสุดเมื่อวันที่ 18 เมษายน 2562 เวลา 11:33 น.